Even as it retreats more into the past, WWI seems to have lost none of its sobering effects on subsequent generations. Information and details on the fate of individual soldiers have become more available and accessible and most of us today are aware of how those grim events had direct consequences for everyone of our families. R.C. 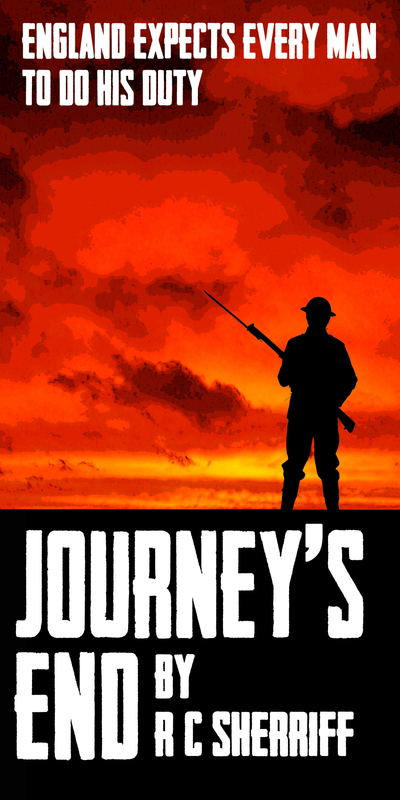 Sherriff's Journey's End is an iconic WWI drama, and the latest Masque production, performed at The Playhouse, the small stage and intimate atmosphere of which is particularly suitable for this play. It is set in a relatively quiet period of the long war, featuring the daily lives of British officers in their dugout, and a raid on the German lines, prior to what all expect will be a major battle. The young Commander of a British Infantry Company, Stanhope, is considered one of the best Officers, and is respected by his men, but the strain of it all is telling, he is near exhaustion, and takes comfort in excessive drinking. This key role needs a charismatic actor with real stage presence and Tristan Smith is well cast in the part, giving another of his compelling and convincing leading performances as the troubled officer. The company is joined by a new recruit, Raleigh, who has pulled strings to serve under Stanhope, who he hero worshipped at their school, and with whose sister Stanhope has a relationship. The naivety, inexperience, and schoolboy enthusiasm of Raleigh are precisely caught by Davin Eadie, a very talented performer in his second production at The Playhouse. Second in Command is Osbourne, an older man, affectionately called 'Uncle' by fellow officers, a mature, steadying, reliable influence, played here by Martin Williams with the necessary gravitas to be expected from such an experienced and accomplished actor. These three are well supported by the other players in character roles and when Rob Kendall appeared as the Colonel with impressive senior officer demeanour, from every pore exuding such natural authority, (only to be expected from someone who in his 'day job' is incumbent chair of Masque Theatre! ), that it was difficult not to stand up and salute. Alistair Way gives probably his best performance for Masque so far as the 'genuine' genial, Officer Trotter, unflappable, mainly concerned with his next meal, and Alistair is most believable here in an effective naturalistic performance. Special mention is due to Peter Collins as the unstable, terrified Hibbert, on the verge of a breakdown, a challenging role, and Peter succeeds in making the audience not condemn but sympathise with his understandable predicament. The ever-irrepressible Craig Macpherson, resplendent in magnificent Sergeant Major moustache, adds some 'Sheffield steel' from the ranks, and is the embodiment of the efficient soldier. Last, but by no means least, light comic relief is provided by Kevin Pinks, perfectly cast as the Officer's cook, giving a fine performance and whose droll comments were much appreciated by the audience. Set in a dugout in the British trenches on the Western Front in St Quentin, Northern France in 1918, the Officers find their own ways of coping with the extreme stress, bombardments, and long hours of waiting: Stanhope drinks whisky; Osborne reads Alice in Wonderland; Trotter fills in circles representing the passing hours till they are relieved; Hibbert worries about his phantom neuralgia; Raleigh writes letters to his sister which Stanhope fears will tell her of his drinking, but in fact are full of praise. Among several very memorable moments in the play, the scene between Osborne and Raleigh in the few minutes before an attack on the German lines are very poignant as they talk lovingly about the New Forest and their homes back in England, the horrors of the trenches forgotten for the moment. The enemy, the Germans, 'the Bosch', are not vilified, their situation is in effect seen as no different, and they are shown capable of generous gestures to their foe. The production is in charge of first-time director Ste Applegate, normally seen on stage in leading roles such as a dashing Romeo, raunchy Tom Jones, or a cerebral Thomas Becket, and who gets himself on stage here in Journey's End briefly in a couple of cameos as well. While studying R. C. Sherrifs play Journeys End while at school, I was fascinated with the characters and their stories. I first saw a production of the play at The Duke of Yorks Theatre in London. The atmosphere and sight of the trench set transported me to 1918. I was living the life my Great Uncle, Private Harold Applegate (25th Battalion, Nova Scotia Regiment, Canadian Infantry) before he was shot and killed trying to take the French town of Courcelette. The sound of war from beyond the trench and the smell of wood, smoke and canvas will always stay with me. Since school, I have seen many different variations of the play, each time finding myself getting more and more entwined with the stories it tells. The play takes place in the trenches near Saint-Quentin, Aisne, between 18 March 1918 and 21 March 1918. It mainly follows five officers during the first few days of their takeover of the officers' dugout during the run-up to the real-life events of Operation Michael. This is Ste Applegate's directorial debut for Masque Theatre.